There’s gold in them there hills. 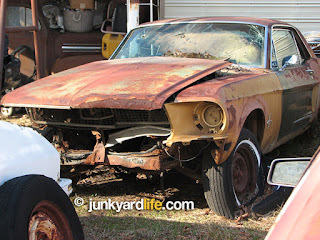 Recently, Junkyard Life was given a crash course in rare edition Mustangs. More specifically, the 1968 Golden Nugget Special Mustang. It started when we were having lunch with Junkyard Life brother, Chris Sanderson, and he mentioned that his parents owned a Mustang that could very well have been a Golden Nugget. After pretending that we actually knew what that was, we did a bit of research, and learned some very interesting things regarding this elusive collectible. 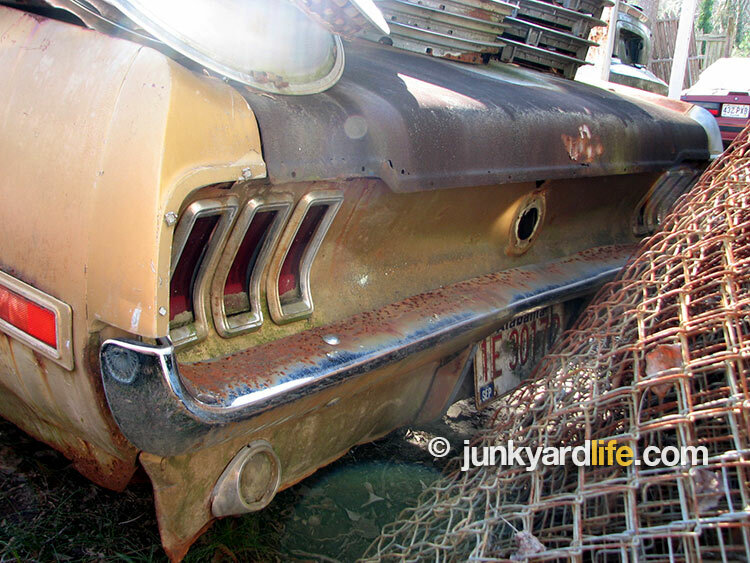 Tail lights and possibly Sunlit Gold paint on what could be a 1968 Golden Nugget Special Mustang. One reason we were not aware of this pony package is because they were not sold in our area. We live in the southeast United States and Golden Nugget Specials were a west coast promotion. Much like the original gold rush, Ford only told pony prospectors in the Oregon and Washington area. You thought I was going to say California, didn’t you? I still have to cry foul, seeing as California seemed to get all the limited editions and special packages. Those California dealers would’ve had no trouble finding a Golden Nugget ’Stang and offer to do some horse trading for one, due to their proximity. Magazine ad notes that only 525 Golden Nuggets were offered for sale, some sources claim only 481 were built and sold. The year was 1967 and Ford had a runaway hit on their hands with the versatile Mustang. They couldn’t stop selling them if they tried. During the previous year, they sold their one-millionth Mustang. 1968 would be another blockbuster sales year, despite the late introduction of the competitive Chevrolet Camaro, and, the even later, Pontiac Firebird. Perhaps Ford maintained a series of special edition Mustangs out west to show their appreciation to the automotive-obsessed buyers on the west coast, who accounted for 20% of all Mustangs sold. The California Special and Golden Nugget Special would lure buyers looking to stand out in a sea of ’Stangs. 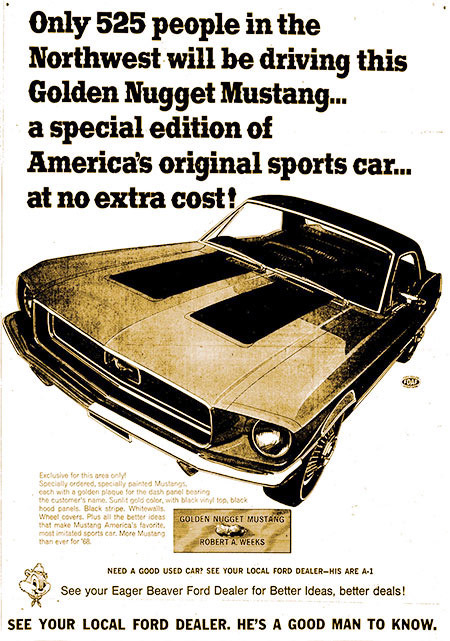 Golden Nugget Mustangs were marketed in Seattle’s sales area, which included Washington state, Oregon, and Alaska. Vintage magazine advertisements do not specifically mention a dealership. To us, that indicates that they were not ordered by any one imaginative dealer. A black vinyl top was part of the 1968 Golden Nugget Specials features. The vinyl covering is long gone but there’s evidence a vinyl top once lived here. The 1968 Gold Nugget Mustang had a few distinguishing characteristics and still leaves a few mysteries. Sources agree on the vinyl top, but not so much a color. Golden Nuggets could be special ordered in any available Mustang color. The GNS was not so much a performance option, as it was an appearance package. I noticed many different engine and transmission combos. However, I didn’t read up on a Golden Nugget with a 390 engine. That would be interesting. 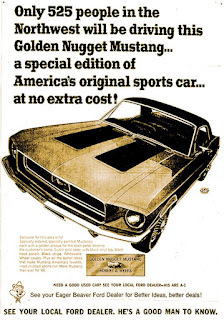 Golden Nugget Special Mustangs featured a center-mounted dash plaque, with owners name as part of the GNS option. 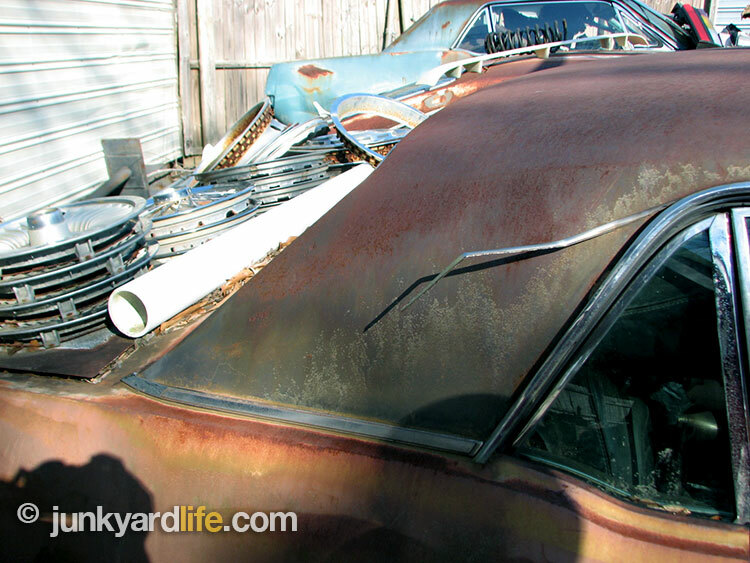 Picture this — when Chris Sanderson mentioned that his family owned this car, possibly an original Golden Nugget, we high-fived and invited ourselves over for a look. We totally missed the part where Chris told us the car was unverifiable. He tried to tell us. But wait, this Mustang does have a few options associated with a Golden Nugget. Such as, it does indeed have a vinyl top, and a rear window defroster. However, a gold Mustang does not a Golden Nugget make. It has several clues to make a Golden Nugget prospector suspicious. The one thing that could end the suspicion is missing. The most important clue — the VIN number. Why, oh why, would Ford put such important information on the driver’s door? The most frequently used part of the entire car. Also, a very easily substituted item. One that could be replaced with an entirely different and incorrect VIN and trim codes. 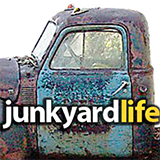 Very frustrating for Junkyard Life detectives, indeed. Chris did try to tell us, but we had gold fever and couldn’t be told anything. We may not have actually discovered a Golden Nugget in this stash. The hood was questionable. It did not appear to be original equipment, thus lacking the black stripes of a GNS. Also, the driver’s side door had been replaced with another unoriginal door. This one was green. Let’s look at it like this – Junkyard Life got to spend the day with the Sandersons and their awesome collection of Mustang stash. So, even if it is not a Golden Nugget, our day was totally worth it! 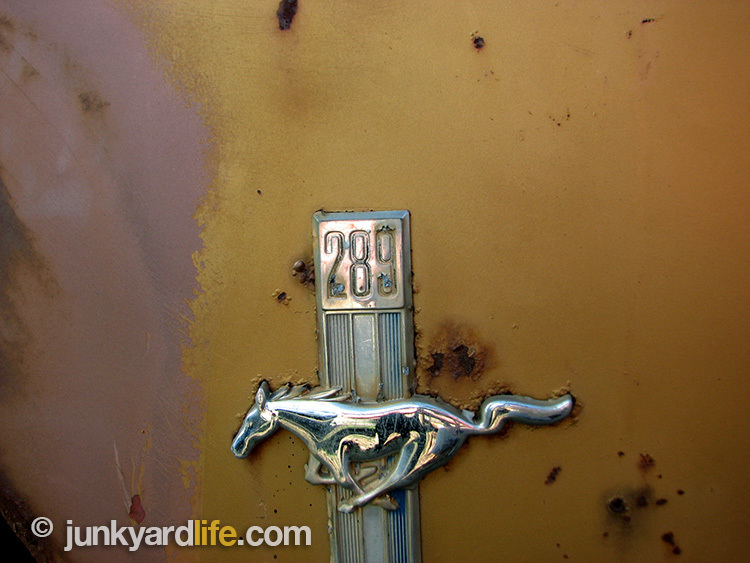 289 emblem on this 1968 Ford Mustang does not help us decide whether this is a real GNS. Golden Nugget Specials came with various engine and transmission options. 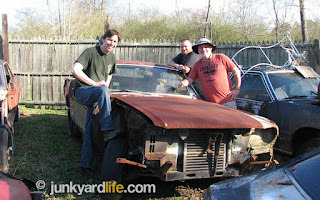 Jody Potter, Chris Sanderson, and Ron Kidd crawled around at least three dozens Mustangs in this ponycar graveyard. No clues are left to decipher whether this is a true Golden Nugget. Wrong hood. Wrong door – no door data plate. No dash plaque. 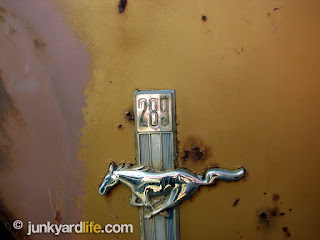 We can’t say for certain that it isn’t a Golden Nugget.We’ll keep the dream alive because this old Mustang ain’t moving. The original “Bullitt” Mustang was not actually Ford approved. That was why the beautiful green fastback, in the movie Bullitt, had all of the emblems removed. Several sources cannot agree on what actually powered the famous Bullitt car. 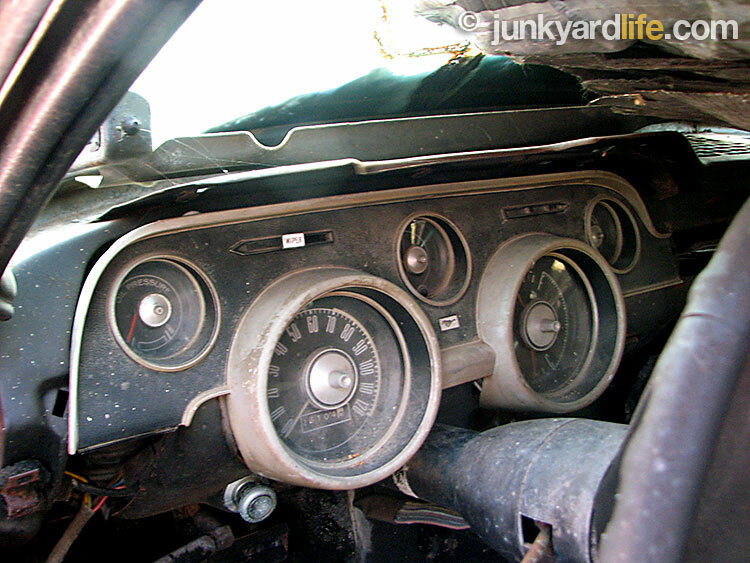 We know it was a four speed, but was it the 390 or the 302? Junkyard Life surmises it could have been both, seeing as they had to use a few cars. 1968 Mustangs used a special steering wheel that some people loved. Some buyers hated. We love it. If we had a 1968, it would for sure have this wheel. That is a fact.